The Frei Brothers 2009 Reserve Cabernet from Alexander Valley exhibits all of the characteristics of a truly wonderful Cabernet. Dominated by dark fruits and berries, this bold wine has a nice full body and displays a fine balance with suggestions of cedar and spice, followed by a satisfying lasting finish. 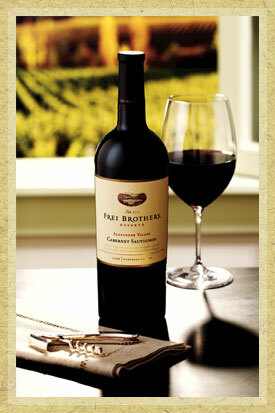 I selected this as a “go to” Cabernet this week, as it is a great choice for Cabernet lovers looking for a great value. This Cab is sure to please those seeking an everyday wine at a great price and also makes a nice gift. At around $19.99 this is a true bargain.